Looking for the perfect picnic menu to make memories with the love of your life? Look no further! This is the place to kick start your imagination into making memories the two of you won't soon forget! Summer's warm and sunny weather is begging you for a picnic. Cozying up with your partner and spending quality time together is a sure fire way to build intimacy in any relationship. Food is one of those sensual pleasures that people enjoy. Make it simple, make it gourmet or get creative with a few new recipes you've been dying to try. Don't want to cook? No problem, pick up your favorite take-out! Finding the perfect picnic menu doesn't have to stress you out. It can be as simple as you like or as gourmet as you want it to be. But, don't forget - It's still a picnic! Keep It Simple - Choose recipes that are easy to prepare, easy to eat and easy to clean up. Choose a few food items that can be enjoyed at room temperature. For food and beverages that are better served cold, chill them well ahead of time and keep them in a cooler. Pack your dips, dressings and hummus in square containers so that they're easier to pack, and put them in resealable bags to minimize leakage and cleanup. Make a check list of the supplies you will need before you go. Don't have a beautiful picnic basket? Don't let that stop you! This picnic basket is already packed full of delectable treats. Everything needed for a lazy day in the shade of a tree. Just add sunshine and the love of your life. Assorted cold cuts, along with cheese, a fresh loaf of bread and pickles is quick, easy and satisfying. Cook a chicken the day before and have it cut up and ready to enjoy cold at your romantic picnic. Add a classic caesar salad, and you have a meal. Prepare an assortment of your favorite seafood. Shrimp, crab, and lobster are delicious served hot or cold. Or grab a couple cans of smoked oysters and/or smoked mussels and an assortment of your favorite crackers, which takes no time at all. Instead of making them ahead, pack all the ingredients to prepare when you are ready to eat. A crusty fresh loaf of bread is a staple in most picnic baskets. You can make your sandwiches, dip it, spread it, or dunk it. A simple and delicious idea - Take a brick of cream cheese and top with your favorite spread (jams or jellies). Spread this on bread or assorted crackers. Cold fruit is the perfect picnic food. Fast, easy, tasty and satisfying. Something as simple as cut up apples (brushed with lemon juice to prevent browning), sharp cheddar cheese and a baguette cut up, is the perfect light finger food to snack on. Let your imagination go wild. Crunchy, cold and colorful. Bring along some assorted dips and you have something healthy and light to go with your sandwiches. Take it to the next level and grill an assortment of veggies a day ahead. What spells romance? Strawberries and chocolate - O.M.G.!! I don't need to tell you to keep both of these cold. Add a twist and feed it to each other. Choose a few of your favorite items off this list or create your own perfect picnic menu and start making memories!! Thinking it may might be more work than it's worth? 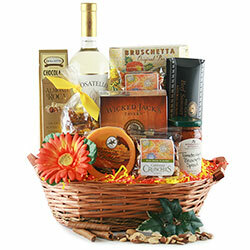 No problem, this picnic basket is equipped with everything you will need to make your romantic picnic menu happen! Picnic in the Park offers an impressive combination of of savory gourmet crackers, cheese, sausage and rum cake, to name a few and your choice of a wine or champagne.